Your first choice is fit. Do you prefer looser fitting running shorts and pants or form fitting running tights (like bike shorts)? If you have sensitive skin or are prone to chafing, tights have worked best for me. They stay put and protect the entire area from your inner thigh to above your knee (at a minimum). Your next option is length. There are offerings in everything from ankle length to those attractive (ha!) shorts that barely cover your “cheeks”. 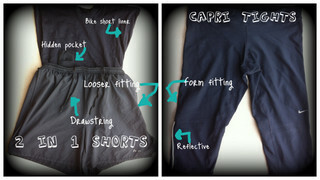 If you’re on a budget, Capri length provides the most versatility. They can be worn nearly year round. Your final choice is liner style. Here’s an insider tip: runners go commando! That’s right. Don’t wear underwear with your running shorts or running tights. If that makes you uncomfortable, choose lined shorts. There are typically three options – no liner, 2 in 1 liner (similar to bike shorts with shorts over top), and underwear style liner. If you are not into spandex or looking like Rafael Nadal, but want some chafing protection, don’t fret. 2 in 1 shorts are a good alternative to Capri tights for both guys and gals. I’ve run two marathons in 2 in 1 shorts, without problems, but I have chafed in them on occasion. Just make sure that you really slather on the anti-chafing balm. There is one more option – a running skort (with bike shorts). This is a much cuter option for the ladies, but I have doubts about covering 26.2 miles chafe-free in them. Since I have never run in a running skort, I can’t speak to it. I will give one a try soon and report back! As I mentioned in my post on running shirts, if you need to run in colder weather, consider your temperature threshold. If you are on a budget, capris have worked well for me in nearly every temperature with the addition of longer running socks. It doesn’t look too cute, but it is cheaper than buying another pair of running tights. If you have running shorts, you should consider swapping them out for running pants or ankle length running tights in cold temperatures (below 50 F for most runners). Tip: put on anti-chafing balm around any ankle zippers on the pants and tights as they can chafe you! So what have you decided to run in? Will it be shorts or tights? Leave us a comment and let us know what you’ll be training in and why! Stay tuned for next week’s post about socks, which continues our series on Running gear that every marathoner needs.